Landscape designs are created in order to show off your outdoor space, and provide a pleasant environment for friends and family. But once the sun sets, those beautiful design details may become invisible, but they don’t have to. 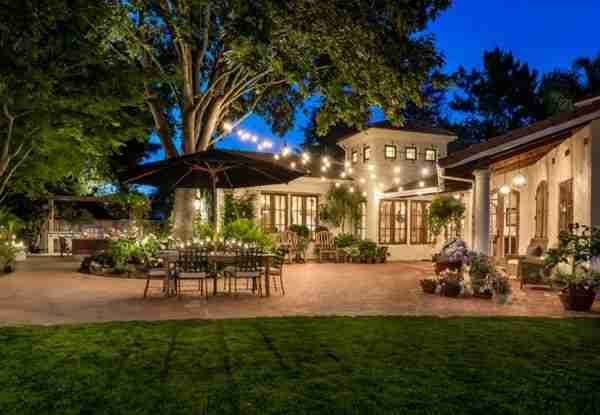 Landscape lighting will continue to make your outdoor space glow and shine, creating an inviting ambiance for guests, and most importantly for yourself and your family to enjoy. The first thing to remember about landscape lighting, is that less can be more. Because the eye is naturally drawn to areas that stand out, it doesn’t necessarily take many light fixtures to create a beautiful affect. It is important to consider what features you want to stand out, and determine how you plan to coordinate your landscape lights within your outdoor space. Where should you install landscape lighting? 1) Any area of your home that you’d like to highlight. If you have a beautiful home, this could be your entire house. You should especially consider this if you’re planning to sell your home, remember that potential buyers are not only driving by your home during the day, they may also pass it in the night, so why not make sure it’s looking great around-the-clock? You can use spotlight to highlight areas of your home as is done in the image below. 2) Consider lighting the main walkway to your front door. A great option for this is motion-activated sensors, which will light up as people walk past them. These increase your home’s safety by allowing guests less familiar with your property orient in the dark, they will also help you save money and energy, since they only light up when they’re needed. 3) The back and side entrances of your home are probably the darkest, and therefore could be the most dangerous for family and friends walking around your outdoor space. It is important to place landscape lights in those areas, to ensure your safety. Consider placing LED lights, which consumer significantly less energy and last much longer compared to florescent lights. If you have a larger property and need stronger lights, flood lights could be a good option. 4) Your backyard may be an area you spend a considerable of time on the weekends during the day, but why not make use of it in the evenings too? One way to do this is to add light and make it a hospitable place to visit no matter the time of day. One of our favorite ways to do this is through string lighting, they add a romantic and whimsical touch to space. 5) The porch can be a wonderful area to spend time with family and friends on a summer evening. 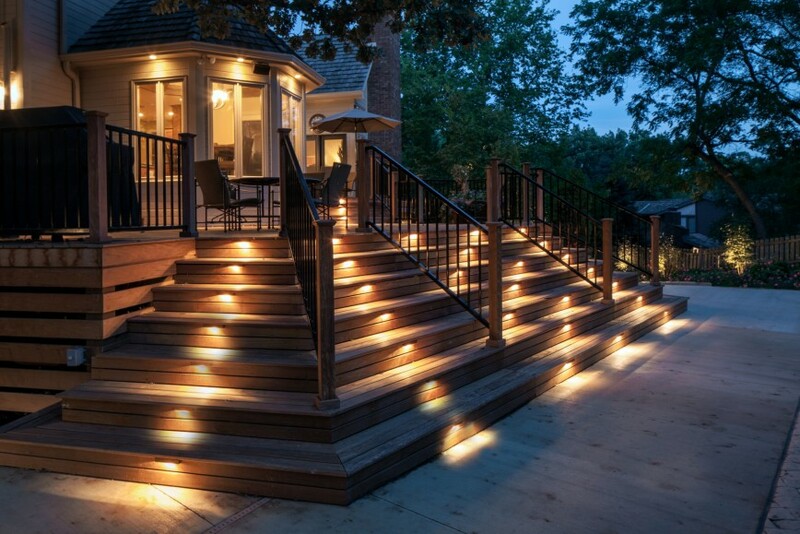 Placing lights on the porch is sure to enhance your outdoor living environment. Consider wall lights or hanging lights that will not interfere with your space, but will be very useful for lighting up your area for the night. This will help create a relaxed and casual mood for your porch. If you have a particular outdoor reading area, consider placing a spotlight in the tree, aiming down on over your shoulder. 1) Color Temperature: Remember that light quality is equally as important as light quantity. The color temperature will be displayed on the packaging of the light bulb, and is measured on a Kelvin (K) scale. A color temperature of 3500K or over, are known as cooler temperatures that become bluer in tone in sun. 3500K and below, are considered to be warmer temperatures. Cooler temperatures tend to make landscapes unnatural. Warmer color temperatures of 2700K is ideal, giving a more soothing and natural tone to your outdoor space. 2) Layered Lighting: Layered lighting is when one can create and give a sense of “highs and lows”, in order to add emotion and different moods to the specific space. Layered lighting can be displayed as simply as having different lights on different circuits, or by using dimmers and controls. This allows you to have different lighting settings for different situations, for example having different lighting on your patio for dining, partying, or simply relaxing. This is a great way to exercise your creative abilities and can be a very fun project to experiment with! 3) Low voltage: Using low voltage fixtures is absolutely the right way to go, especially in a residential outdoor area. There is no danger of shock, and the cable can be run on the ground, or buried slightly underneath. Our truck picking up salt to keep your walkways and driveways clear and safe. • Canadian Nursery Landscape Assoc.